rest in Evizone’s data centers. or 3rd Party compliance archive. data laws and regulations such as GDPR. and encrypted at rest in Evizone’s data centers. Evizone Secure Messaging is a Software as a Service solution. Click a feature to learn more or scroll through all features. Responsive web application provides easy install-free access from desktop computers and mobile devices. Registration takes less than a minute for your users. All it takes is an email address to add a contact. Unregistered contacts are provided with a Personal Account that gives them full use at no charge to you. Messages and attached files can be archived in Evizone Communications Governance service and 3rd Party archive. Easy management interface allows the administrator to choose the frequency of update. Use of EML format makes it simple to import messages into any archive. Federated service is deployed globally in order to comply with local data laws and regulations such as GDPR. 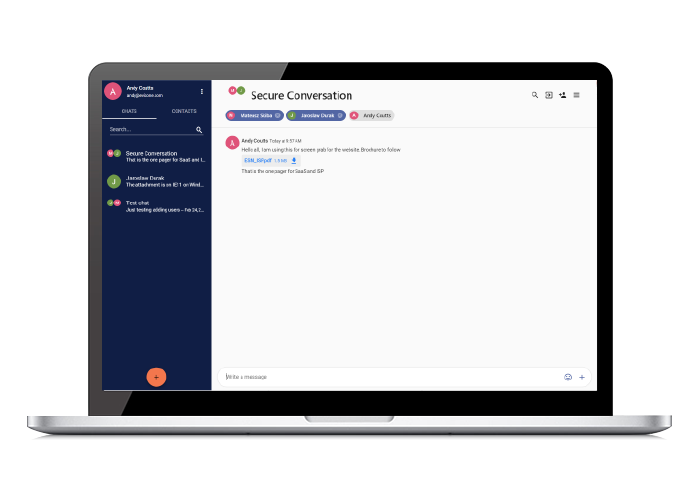 For SaaS, service providers and associations, Evizone Secure Messaging is easily deployed as a separately branded private service designed to meet your customer and member needs. ESM will automatically enforce customer-controlled retention and archival policies. Tight integration with Evizone Communications Governance provides compliance with near real-time access to ESM correspondence. All correspondence is encrypted in transmission and encrypted at rest in Evizone’s data centers. Access indicators let you know when chat recipients have read your messages and downloaded your files. ESM’s user registration takes about 30 seconds. Users can correspond with external contacts simply using an email address. External contacts are provided with full access to a Personal ESM Account. Enterprise customers can manage users using Active Directory. ROTH Capital Partners is a full-service investment banking firm, specializing in the small and micro-cap markets. Willow Tree Capital Group is a boutique investment bank that provides strategic advice and assistance. Chestertons is one of the oldest and most established luxury real estate agencies in Barbados. Westridge is a Professional Employer Organization (PEO) dedicated to helping business owners return to what they do best – run their companies. It will only take a minute to register a business or personal account. Adding users to your business account allows you to enforce policies and ensure that secure messages and attached files are archived. To get more information from Evizone Secure Messaging, use the following form to make your request. If you would like to have a web conference with an Evizone representative to learn more about the service and discuss your requirement, please provide your phone number and availability in the Message content.